Now available the New 11 inch June Bug, Pi Biedy & BJ Kendreck! Lady Marion as seen on the cover of Doll Crafter & Costuming Magazine. ELCOME TO LINCOLN MOLD COMPANY! 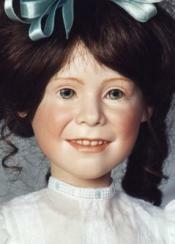 WE OFFER A wonderful collection of porcelain doll molds and doll clothing patterns created by the artist Betty Bailey. 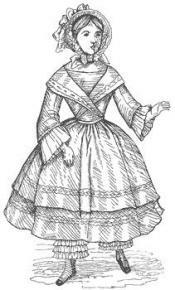 Our Fashion Plate Collection includes molds for victorian era dolls, and we offer many carefully researched authentic Victorian doll clothing patterns designed specially for these highly collectible dolls. The Front Porch Collection captures the essence of childhood with it's expressive faces. All dolls made from molds in this collection are made with the same body. Children's clothing patterns are also available. You will find patterns to fit American Girl Dolls, as well as carefully researched authentic civil war uniforms, and civil war era dresses and wedding gowns. The inspiration for this doll body is an unnamed antique French body that was used by Bru, Huret and Jumeau. The doll itself was around 15 inches. The original antique body was made of wood and was fully jointed. The body is easy to pose and has life-like movements with her ball joints. The height of the body from feet to top of shoulder plate is 9 inches. The finished doll is 11 1/2 inches. She is perfect for reproduction antique heads. Her feet were designed to wear those beautiful little shoes with a bit of a heel. The shoes that I used in designing the feet can be purchased from Land of Oz Dolls. The shoes with the heels actually completes her balance. Land of Oz Dolls also have beautiful heads that fit, eyes, wigs and other supplies for these "Elegant Ladies". Our body is made of an air drying composition that is light weight and very strong when dry. As strong as fired ceramic but doesn't brake as easily. The body is finished with a smooth enamel that is very durable. The soft body color matches Bell's "French Glow" porcelain or Seeley's "French Bisque". The body is well designed and balanced. LINCOLN MOLD COMPANY will be in the sales room of: This years IDMA convention coming up. Now available is an archive of previous issues of our newsletter. Download a free Dress Form Pattern and see the quality of our patterns for yourself. 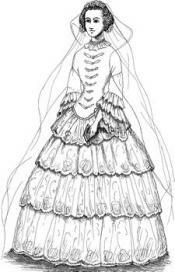 This dress form fits clothing for our 24 inch Fashion Plate Collection. Free pattern shipping to USA for orders $50 or more! When you order at least $50 of molds or patterns, the patterns will be shipped free. Even if the order shows the pattern shipping amount, you will not be charged. This offer applies only to shipping in continental USA.